If you run the same Disney half marathon each of its first five years you become a legacy. 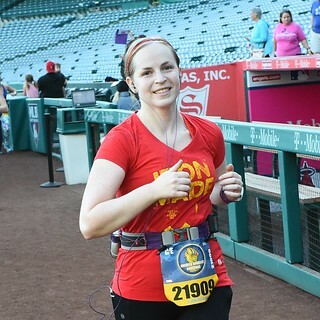 One of my friends is earning her Tinkerbell Half Marathon legacy status in May and I’m jealous. But with my late appearance on the running scene the opportunities for me to attain this kind of distinction have been minimal. 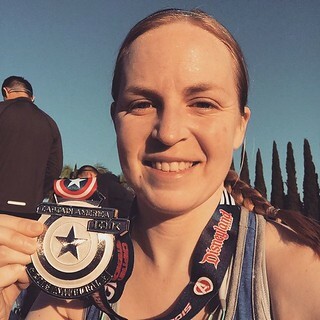 But last November I participated in the Inaugural Avengers Half Marathon at Disneyland, and began my journey towards legacy status without realizing it. This year when I signed up for the Infinity Gauntlet Challenge (Inaugural Captain America 10K + 2nd annual Avengers Half Marathon) keeping my legacy status alive was forefront in my mind. Granted, it doesn’t really mean much, but I must admit that I’m slightly addicted to running perks. Shirts, medals, photos, etc. At least it’s a healthy addiction, right? On Sunday morning I woke up at 4 AM rather than 3:30 AM. I didn’t want to spend as much time out in the cold with only a mylar thermal blanket for warmth while waiting for the half marathon to start. As lovely as the weather was for running, it was too chilly to be standing around doing nothing for over an hour. I decided to wear an Elsa t-shirt for the race because it kept my shoulders and back covered (less frustrating sunscreen application required, and it also kept me a bit warmer pre-race), but I stuck out like a sore thumb in the sea of red, white, and blue in the corrals. You’ve never seen so many people dressed like Captain America in your life. 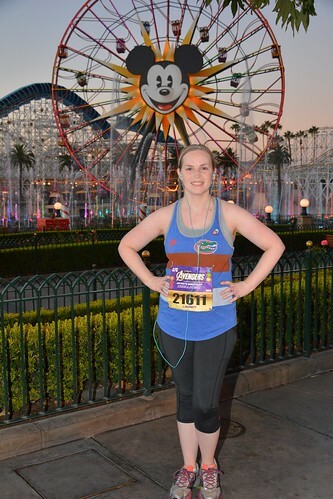 In stark contrast to the Disneyland Half Marathon, I was one of the few runners in princess-inspired gear. Dare to be different! I actually intended to wear an Iron Man pin as an homage to the superheroes, but I forgot it in my hotel room. Sorry, Mr. Stark! When I crossed the start line I had no idea how the race was going to treat me. Was I going to be fast or slow? Was my breathing going to be easy or labored? The answers were not immediately obvious, but I wasn’t feeling too bad early on so I had that going for me. The weather was nice and cool which helped a lot. When I passed the 10K mark and got a text on my progress for the first 6.2 miles I realized that I was on pace for a personal record. 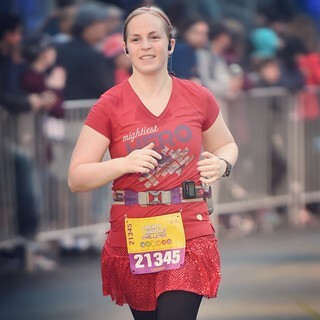 My fastest half marathon (by about 5 minutes) was this same race last year and the thought of setting a new PR on the same course was really exciting. And I did it! The last couple of miles were tough, but I pushed myself to finish strong when all I wanted to do was walk. As I crossed the finish line I knew I had achieved a PR (based on some rudimentary subtraction I did in my head when I saw the clock time). This led to an embarrassing celebration on my part, which should make for some interesting professional photos. I’ll let you know once they’re available. My official time was 2:39:48, which is more than 6 minutes faster than my previous personal record. That’s incredible! I was so happy. After collecting my Avengers Half Marathon and Infinity Gauntlet Challenge medals, a new mylar blanket, and a much-needed bottle of water, I walked back to my hotel room for a lovely shower. The rest of the day was pretty uneventful. I drove back to Seal Beach, ate a delicious late breakfast at McDonald’s, and then spent the afternoon on my couch catching up on TV shows. It was glorious. 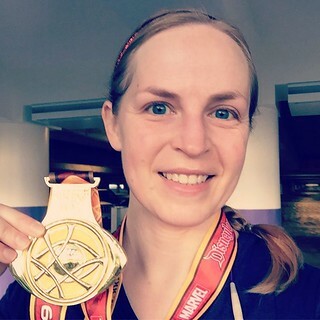 While basking in the glow of my spectacular success I was already looking forward to next year’s Avengers Half Marathon so I can not only maintain my legacy status, but also chase a new personal record. This is definitely my race!